Building a three season porch is a great way to expand your home’s living space and enjoy a little more of the outdoors, without the insects. How big should the three season porch be? How will it tie into the existing house? How do you plan on using the three seasoned porch? Where will the entrance be from the house to the porch? Should you future-proof the porch to enable it to eventually become a full home addition sometime later on down the road. With these key questions answered, you should have enough information to begin the building of your three season porch plans. Usually your plans do not need to be too complicated. Typically all that is required are some scaled drawings with dimensions included. You will also need to have a few cross-sectional drawings showing the key structural support areas, e.g. foundation to the walls, to the roof rafters. Your three season porch drawings should include the locations of all doors and windows, roof pitch, wall thickness, deck construction and foundation/footing construction. Once you have completed your plans and sketches, you should apply for a building permit for building the three season porch. Depending on your specific plans, you may need to pull construction, wiring, and plumbing permits. Without a building permit you will be subjecting yourself to problems down the road, both with your local municipality and your homeowner’s insurance policy. During the building of a three season porch you should have scheduled inspections performed by the local building inspector to ensure your building your porch to the approved plans. You do not want to get to the stage where you have installed sheetrock on the interior walls and then ask for a rough framing inspection. 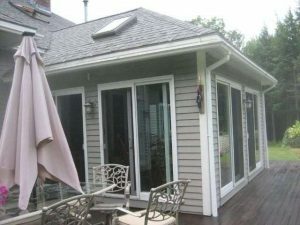 With permits in place you can begin building your three season porch. Once you have identified and marked the location of your new three season porch, using string and stakes, you can next locate where you want to install your porch’s footing pads. Make sure when marking the corners of your three season porch that they are perpendicular and parallel to each other and the existing house. Using a string, measure on the diagonals to confirm the sides are of even length and square. Normally three season porches are built on Lally columns or wood posts that sit on top of footings. The footings are concrete pads that have a base that sit well below the frost line. Footings can be constructed using Sono-tubes or by making up a form. Footings should be 2-3 times the area of the support posts. The footing pads should be constructed using poured concrete and should be allowed to set up for 2 or 3 days. If the three season porch is to be constructed on top of a full foundation, then perimeter footings and concrete pads will be required. The perimeter footings will support the foundation walls and the concrete pads will support Lally columns that are typically located in the center of the room space. Once the footings have been poured and are cured, you can begin to frame the three season porch. Framing of the porch begins with the building of the porch deck. The porch deck is constructed by first installing a ledger board onto the existing house. Once the ledger has been attached to the home with lag bolts, side rim joists can be attached to the ledger board. Then the front rim joist can be attached to the side rim joists using joist hangers. Once the perimeter of the deck has been framed, level and square it up. The rim joists can be attached to the deck posts that rest on the footing pads. Again, make sure the deck is square by using string and measuring on the diagonal. Note that depending upon how large of a deck porch you are building, and the size and type of floor joists you are using, a center beam may be required. With the perimeter of the deck level and square, attach the joists hangers to the ledger board and the front rim joist. Then install the floor joists to the hangers. Typically you will want floor joists installed on 16” centers. With the deck frame in place, install floor sheathing (e.g. 3/4th inch tongue and groove plywood) to the floor joists. Framing the walls of your three season porch is relatively straight forward. Frame the walls on the deck and then raise them into place. Note that you may need to remove a portion of the eaves from the existing home’s roof to raise the walls into place. You will have to cut into the existing roof to do this. Once the walls have been constructed, raised into place, secured to one another, and are confirmed square, you can move on to the roof. If you did not add sheathing to the walls while constructing them on the deck, add the plywood / OSB sheathing to the walls after they have been secured in place. The porch’s roof should tie into the existing home’s roof line. You can either stick build your roof or use pre-built roof trusses. My recommendation is to use pre-built roof trusses. For a three season porch, the size of the roof trusses are manageable to install with 2 or 3 people. When installing the roof trusses start at the outer end of the porch and work your way inwards towards the existing house. Once the roof trusses are in place, use a string line to determine the length and location of the ridge board. The ridge board attaches from the last truss installed to the existing home’s roof. Next install valley rafters and jack rafters perpendicular to the ridge board and with the same roof pitch as the porch trusses. With the roof framing nearly complete, you can append an overhang on the outer gable end of the roof. You can than add plywood sheathing to the roof trusses, install the soffits and fascia boards, and shingle the roof. With the porch walls and roof in place, it is now time to install the doors and windows. If you framed out your door and window openings properly they should be about 2 inches wider/longer than the actual rough window sizes. Install the doors and windows into the rough door and window openings ensuring that they are installed properly. Make sure that the doors and windows are square and plumb when fastening them to the exterior wall sheathing. There are a number of exterior siding choices to choose from, however you should try to match the siding material that is on the existing home. If it is clapboards that you are installing, start at the bottom of the porch and work your way upwards, maintaining the same reveal as the existing home siding. Use a chalk line to ensure your lines remain straight. You may want to add a trim skirt along the perimeter of the porch walls to make your exterior siding effort easier and more appealing, however, this is somewhat predicated on how the siding is attached on the main part of the house. With the three season porch closed in from the elements, this is usually a good time to punch into the existing home to create the doorway. You will want to take care not to cut any live electric wires, and you will want to demo the area carefully to limit the mess. First remove all of the home’s exterior siding around the interior of the porch area. Next mark the area of the future doorway, and use a circular saw to cut around the mark. Do not set your blade deeper than you have to (the width of the home’s exterior sheathing). Now remove the sheetrock from the area inside the house. Again, you will want to mark the rough area for the opening. The use of a carpenters knife may also help to minimize the demolish-in and mess. With the sheathing removed, you should now have access to the wall studs. Remove the required studs, and build a new header for the doorway opening. Note, if there are structural concerns, you may need to brace the ceiling prior to removing the stud/studs. With the porch buttoned up, you can now install the rough electric wiring. The wiring should tie back into the main circuit breaker box, however it should not be connected into the main circuit panel until the finish electric is complete. If plumbing is required, also rough it in at this point and time. If you want to future proof your porch, you may want to consider installing insulation into the porch walls, roof, and floor areas. Once the rough electric and insulation have been installed, you can now install your interior sheathing. This could be drywall, bead board, or paneling. If installing drywall, it is best to prime and paint it before moving onto the interior trim work. Once the interior sheathing has been installed, you will want to install the interior trim around the doors and windows. Now install the light fixtures, outlets and switches, and any plumbing if it is required. All that remains is to install the finish flooring and painting the exterior walls and your three season porch is ready for use. 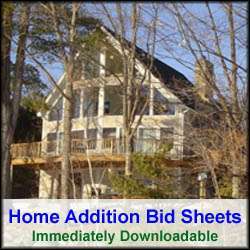 For more help on building a Three Season Porch or Family Room, see HomeAdditionPlus.com’s Room Addition Bid sheet. The Room Addition Bid Sheet will teach your how to hire the right general contractor and subcontractors for your family room addition, and help to ensure that your project is completed on time and budget.